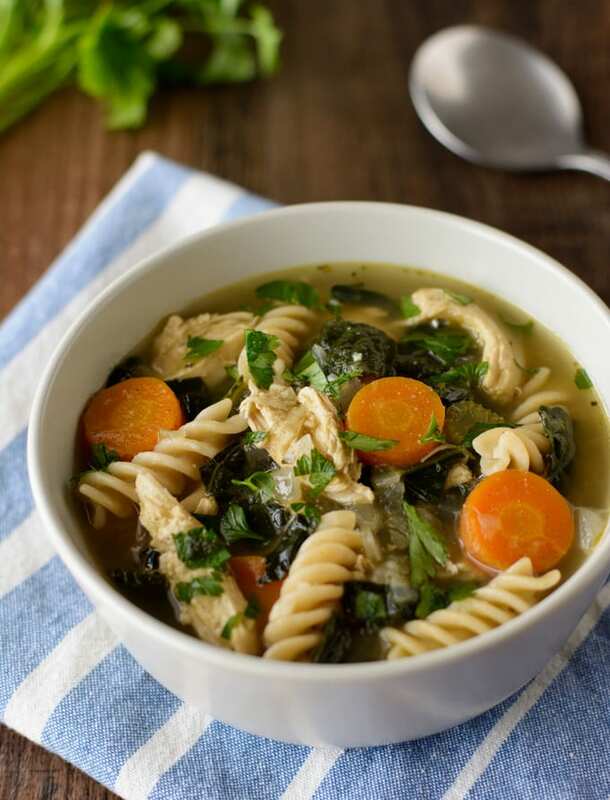 Juicy, tender chicken, loads of veggies and pasta noodles come together to make a delicious and Healthy Chicken Noodle Soup! This classic soup gets a boost in nutrition with the addition of kale. Growing up, when we were sick, there were a few things that were a given. You were going to have to drink a ton of Gatorade and eat some form of chicken soup. The chicken soup would either be Campbell’s Chicken and Stars or Chicken Noodle. I hated both of those canned soups as a kid. In fact, that particular kind of soup never even sounded good to me until more recently. So, I decided to try my hand at making some chicken noodle soup from scratch. It’s SO much better than that canned junk filled with nasty ingredients! 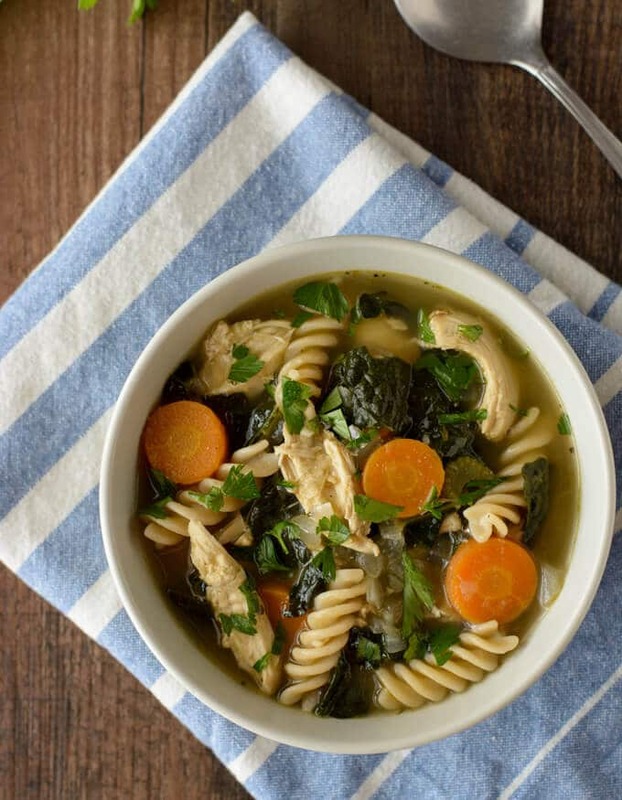 Juicy roasted chicken, loads of tender veggies and pasta noodles come together to make a healthy chicken noodle soup. Make this gluten-free by using gluten-free pasta noodles and chicken broth. How do you make Chicken Noodle Soup From Scratch? With simple soup recipes like this, one of the most important ingredients is a good broth or chicken stock. Homemade is best, but I keep a good quality store-bought version on hand for those times when I don’t have any in my freezer. The Imagine brand Organic low-sodium chicken stock is the most flavorful store-bought version I’ve found. I prefer to roast a couple of bone-in, skin-on chicken breasts, but you could use some store-bought rotisserie chicken if you are short on time. The addition of kale makes this an even more healthy soup recipe. You could substitute some baby spinach if that’s all you have on hand. Just add it at the very end and let it wilt. Egg noodles are more traditional in chicken noodle soup, but I used some gluten-free rotini in mine. The shape is similar, so they work just as well. If you know you are going to have leftovers, do NOT add all of the pasta noodles to the pot. Otherwise, they will absorb too much liquid and swell overnight. Just cook the pasta, place what you need into your bowls and ladle the soup over top. Then, place the rest of the pasta into a bowl, drizzle a little of olive oil on top and stir to coat the pasta. This will help to prevent it from sticking together. You can cook the noodles right in the soup, but you would need more stock or water. 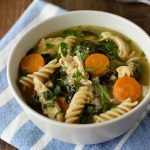 Packed with vegetables, this Healthy Chicken Noodle Soup Recipe is a nutritious and delicious comfort food meal! Use a paper towel to pat the chicken dry. Season with salt and pepper. In a 5-quart dutch oven or soup pot, heat the oil over medium-high heat. Add the chicken and brown on both sides, 5 to 8 minutes per side. Reduce the heat if the pan starts to scorch. Remove the chicken from the pan and set on a plate. Add the carrots, onion, and celery and 1/2 tsp of sea salt to the pan. Cook over medium-low heat until they begin to soften, about 5 minutes. Add the garlic and cook for a minute more. Pour in the chicken stock and stir, scraping up any brown bits on the bottom of the pan. Add the chicken back to the pot and bring to a simmer. Stir in the Italian seasoning and thyme. Reduce heat to low, cover and let cook until a meat thermometer placed into the thickest part of the breast reads 160 to 165 degrees, 10-15 minutes. Take the chicken breasts out of the pot and place onto a clean plate or cutting board. Let cool enough to where you can handle it, then remove the skin, and shred the chicken into bite-size pieces. Bring a separate pot of water up to a boil and cook the pasta according to package directions until al dente, drain and set aside. While the chicken is cooling, bring the pot of soup back up to a simmer, add the chopped kale and let cook until kale is tender, 10-15 minutes. Add the shredded chicken back to the pot and cook until heated through, about 2 minutes. Add the noodles to soup and stir together. (If you know there will be leftovers, do not add the noodles to the pot. Place some pasta into your bowl, then ladle the soup over it.) Stir in the parsley, check seasoning and add salt and pepper if necessary, then serve. If you have leftovers, it's best to store the soup and noodles separately to avoid them swelling. Place into a bowl, drizzle some olive oil over the pasta and stir to coat the noodles. This will help keep them from sticking together. By Tempie at October 25, 2018 .